Students from South London took an exciting trip this week to learn how shmurah matza is made in the heart of North London’s orthodox Jewish community. 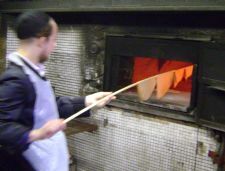 The outing to the Belzer chassidic matza bakery in Stamford Hill was the idea of Rabbi Dovid Cohen who, with his wife Sora, established Chabad of South London Campuses in 2008 to serve the needs of Jewish students on seven campuses in the south of the capital. Water is added to flour, mixed into a dough, kneaded thoroughly, rolled into circles, perforated to prevent air pockets, and baked – all by hand, and all in the space of 18 minutes so as not to become leaven. Students had the chance to witness an army of chassidic yeshiva students carrying out this frantic process from beginning to end while experiencing the sights, smells and sounds of the bakery. Having finished making one batch of matzas, some of the yeshiva students took time out to talk with the visitors explaining the different parts of the matza baking process. “We get a lot of visitors from local chassidic schools, but it is really great when people are interested enough to come from other places,” said one yeshiva student. After learning about matza and how it is made, students took a walk through Stamford Hill. “It was interesting to see the Jewish community here for myself. It was a bit of a culture shock, but I enjoyed it,” said one student. Students also took the opportunity to do some shopping for essential Passover supplies, visit a Jewish bookshop and have something to eat in a kosher restaurant.